In 11 days, delegates of Minnesota's Democratic-Farmer-Labor Party will begin gathering in Duluth to endorse candidates for statewide office. My schedule and stamina will not permit me to join them on the convention sidelines to help seal the deal that makes Paul Thissen our candidate for governor. Thus, I offer these thoughts to the delegates, particularly to my GLBT friends and colleagues. I met Paul several years ago through his wife, Karen Wilson Thissen, with whom I served on a nonprofit board of directors. They are good people. As lifelong Minnesotans, Paul Thissen and I share a deep appreciation and affection for the land, the people, and the traditions that give color and meaning to our lives. Both of us have traveled extensively throughout our state and understand the inherent goodwill, sense of fair play, and yearning for integrity that characterizes our people. Paul embodies these traits with a fresh and enthusiastic optimism matched by a can-do spirit of pragmatism. As the number of days behind me continues to outpace those ahead, I still want to "win" at life's various adventures and to follow my heart with as little compromise as possible. Paul is a solid candidate on the issues that voters and candidates of all stripes should care about. Nonetheless, our party is given to imposing a 100% purity test on issues and - especially - nuances, and then tries to take the safe route by endorsing the candidates who seem to have the greatest name recognition, money, and insider connections. I am old enough to recall the last time Minnesota elected a DFL governor, and I know how well our past patterns of endorsing behavior have not worked. Given the temper of our times, the personality and character of the next governor will be prime in determining the outcome of legislation and policy. We need to play this election to win. As a gay man who never could have imagined the possibility of marrying his high school boy friend, I have experienced personally and vicariously the profound changes of attitude, heart, and behavior within myself and others that have replaced shadows with sunshine, fear with strength, and despair with hope. Like the best of leaders, Paul calls forth the higher angels of our nature. He has done this in speeches to assembled throngs, in one-on-one conversations, and in the introduction and passage of legislation. As the real deal, he also does it in the raising of his own kids, all of whom accompanied us in last year's Pride Parade through the streets of downtown Minneapolis. Would that our own parents ever would have placed in our hands signs that read "Our friend has two mothers, and we think it's great!" As a one-time political candidate, I know about the ineffable campaign experience that Paul has undertaken. I am inspired by his work ethic, the competence and confidence of his campaign team, and the equanimity of his person. I will be proud to have him serve as governor of my state, and I ask you to join me and other Minnesotans for Thissen to help make that happen! For nearly two years, the Southern Theater in Minneapolis has raised its profile as a presenter of new music. A distinctive line-up of four engagements during April will provide the fixings for a spring music marathon, reflecting why some are calling the Seven Corners venue the most innovative for Twin Cities music programming. While not yet 30, Nico Muhly is no stranger to name venues and institutions. A former boy chorister, the Vermont-native-raised-in-Rhode Island graduated from Columbia University with a degree in English literature in 2003, and received a Masters in Music the following year from The Juilliard School, where he studied composition with Christopher Rouse and John Corigliano. He has worked extensively with Philip Glass as editor, keyboardist, and conductor. His compositions for choir include the commission of "Bright Mass with Canons" from New York's Saint Thomas Church Fifth Avenue, and he also has composed for orchestra, opera, and film. He has "done" Carnegie Hall (with commission), the Whitney Museum, and others. In an interview for The Reykjavik Grapevine following last month's Icelandic Music Awards, Muhly observed that "the reasons I make music all stem to thinking about myself as an eleven year old singing in a choir, thinking about my very lonely pre-teen gay boy self....I address my music to that kid, always....I want my music always to be that rapturous, how I felt it then." Muhly's 2007 Minneapolis debut occurred at the Southern Theater, where he returns for two performances in a double bill with pal and colleague Sam Amidon, Apr. 14-15. The very next day will find Muhly at New York City's Symphony Space for the world premiere of "Detailed Instructions," a commission from the New York Philharmonic, followed by a performance at the Metropolitan Museum of Art on Apr. 17. Neither does grass grow under Amidon's feet. On Apr. 10, he released his fourth solo album, "I See the Sign," including contributions from Muhly, Ben Frost, Beth Orton, and his brother, the percussionist Stefan Amidon. Earlier, in March, he attended the Big Ears Festival in Knoxville, Tennessee. Yet, as he recently told the Burlington Free Press in his native Vermont, "I've played very little in the U.S. outside of New York City." A son of the folk artists Peter and Mary Alice Amidon, Sam sings, plays fiddle, banjo, and guitar. PopMatters.com, an international magazine of cultural criticism, described his 2008 solo album, "All is Well," for which Muhly did the arrangements, as "one of the best records of traditional Appalachian folk songs ever recorded." According to press materials, Muhly and Amidon's Minneapolis gig at the Southern "will present an evening of old folk tunes re-imagined, new music for piano and viola, old standards for viola, upside-down music for electronics and voice, and, with any luck, some Schumann." A post-show reception at The Red Stag Supperclub in Minneapolis, Apr. 15, will provide a moment's pause before the musicians continue racking up frequent flyer miles. After his two-day stop in New York, Muhly will catch up with Amidon in Berlin, Apr. 18. There, joined by Frost and Valgeir Sigurosson, they will embark on the Whale Watching Tour, playing stages in Belgium, the United Kingdom, Ireland, France, Spain, Switzerland, Latvia, and Iceland – all by May 16. The Brooklyn-based Gabriel Kahane, 29, along with the six members of yMusic, also will make the post-performance scene at the Red Stag, Apr. 15, before opening their Southern Theater debut at Seven Corners, Apr. 16-17. On the heels of his Lincoln Center "American Songbook" debut, the singer, pianist, and composer will bring to the stage “For the Union Dead,” a song cycle on poems by Robert Lowell, composed specifically for yMusic. The six members of that ensemble include Nadia Sirota, Mike Block, Rob Moose, CJ Camerieri, Alex Sopp, and Hideaki Aomori. Upcoming compositions include a string quartet for the Kronos Quartet, a hybrid cello sonata/song cycle for the cellist Alisa Weilerstein and himself, and an evening-length work for piano, voice, and orchestra, exploring his family’s genealogy and journey from Germany to the United States. Kahane also is completing a new musical for The Public Theater, which recently named him Musical Theater Fellow, and was recently commissioned by the Signature Theatre in Arlington, Virginia, to write an evening-length work. As a performer, Kahane has appeared in recital throughout Europe with Grammy Award-winning bass-baritone Thomas Quasthoff, toured the Schumann Piano Quintet with the Mark Morris Dance Group, and accompanied violinist Hilary Hahn in the slow movement of the Sibelius Violin Concerto in a dirty bar on the Lower East Side of Manhattan. The conservatory-trained members of yMusic, created in 2008, perform as a chamber ensemble, composing and commissioning music that features varied and multiple instruments and musical perspectives. In addition to accompanying Kahane in “For the Union Dead,” the group will play new works by Son Lux and Judd Greenstein, and instrumental arrangements by Sufjan Stevens and Arvo Pärt, employing violin, electric guitar, viola, cello, flute, clarinet, bass clarinet, trumpet, and French horn. Kahane's performance at the Southern will mark the beginning of a North American tour that will take him to Vancouver, Orcas Island, Seattle, Portland, Eugene, San Francisco, and New York. Fewer than three dozen tickets remain for the final, debut season performance by Accordo, Apr. 19. The program will include Beethoven's C-minor String Trio, the C-minor String Quartet by Brahms, and Tsontakis's Knickknacks for Violin and Viola. "Those who attend Accordo's first season," wrote MinnPost.com, "could find themselves bragging about being there when a major new group was born. They have that potential." Accordo includes Saint Paul Chamber Orchestra veterans Steven Copes, Ruggero Allifranchini, and Maiya Paach, and the Minnesota Orchestra's principal cellist, Tony Ross. The ensemble will return to the Southern in 2010-11 for a series of three engagements. I first heard of So Percussion two months ago when the technical director at the Southern Theater, where I serve as executive director, asked whether – should it be necessary – he could drive roundtrip to Missouri, twice, to pick up, rent, and return, a marimba or two. Who knew that the Marimba 2010 International Festival and Conference was coming to the University of Minnesota and Minneapolis and would scoop up every marimba within five states?! Fortunately, we think we have the challenge solved without the driving excursions out-of-state. 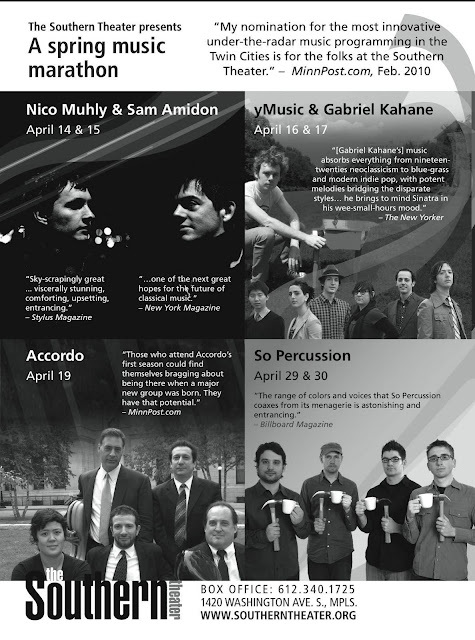 So Percussion's Southern Theater debut, Apr. 29-30, will feature the regional premiere of "Mallet Quartet," a work for two vibraphones and two marimbas, written for the group by Steve Reich, a 2009 winner of the Pulitzer Prize; the work will be presented at Carnegie Hall in 2011. The program also will include the world premiere of "And So," a work for four players on two marimbas, by Mary Ellen Childs, a Minneapolis-based composer; "String of Pearls" by David Lang; "It is Time" by Steve Mackey; and "Music for Pieces of Wood" by Reich. The four principals of So Percussion, Eric Beach, Josh Quillen, Adam Sliwinski, and Jason Treuting, formed their ensemble in 1999 while attending the Yale School of Music. Their work has been performed at domestic and international venues, including the Lincoln Center Festival, Carnegie Hall, Brooklyn Academy of Music, Stanford Lively Arts, and the Cleveland Museum of Art. Artists from more than 20 countries will attend the Marimba 2010 International Festival and Conference, Apr. 28-May 1, hosted by professor Fernando A. Meza of the University of Minnesota School of Music. In addition to the Southern Theater, the festival's artistic partners include the Minnesota Orchestra, Saint Paul Chamber Orchestra, VocalEssence, the Schubert Club, Frederick R. Weisman Art Museum, and Minnesota Public Radio. The festival will present 21 recitals and three lecture/demonstrations at the Ted Mann Concert Hall on the university's campus. The concerts on Apr. 28 at 7:30pm (Ted Mann) and Apr. 29 at 11am (Weisman Museum) are free and open to the public. The Southern Theater is located at 1420 Washington Avenue South at Seven Corners, Minneapolis, Minnesota. Tickets may be ordered online at www.southerntheater.org or by calling the ticket office at 612.340.1725.